Part of saving our environment relies heavily on figuring out new ways to process our natural resources in a self-sustaining, cost effective way. 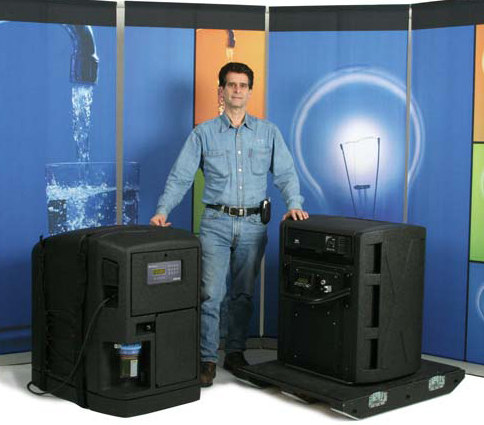 Dean Kamen, the man who brought us the Segway, has just such a solution in the form of a water purification device called the Slingshot. Kamen claims the Slingshot can take nearly any source of moisture–including ocean water, urine or sewage–and quickly turn it into safe drinking water. The Slingshot process operates by means of vapor compression distillation, requires no filters, and can operate using the most efficient fuel known to man: cow dung. In addition to producing drinkable water, the Slingshot also generates enough electricity to light 70 energy-efficient light bulbs. In order to push adoption of the potentially Earth-changing gadget, Kamen hopes to seed thousands of the units with local village entrepreneurs, in much the same way independent cell phone businesses have thrived and gradually changed the face of many impoverished areas around the globe. Although not ready for pick-up at your local Wal Mart, Kamen’s future target price for the device is in the $1,000 to $2,000 range (a rather attractive price when you consider what we pay for laptops and cell phones). You can see Kamen showing off his new invention by vaporizing Stephen Colbert’s toxic potato chips here.